#AceSalesNews – Sept.10: The iPad has got bigger. Apple boasted about how the new iPad Pro (12.9in diagonally) has 5.6 million pixels and more graphics processing power than 80% of the laptops shipped in the past year. It has also added two accessories that will have Microsoft Surface fans choking on their cornflakes: a one-piece cover-keyboard that attaches magnetically and a pressure-sensitive stylus. Both are optional and each will appeal to particular segments. Although there are already plenty of third-party keyboards for existing iPads, Apple will have the Pro keyboard segment to itself for a while. The iPad Pro, besides being big, is heavy. The 9.7in iPad Air 2 from 2014 weighs 0.96lb (437g); the Pro’s weight is not even mentioned on the “tech specs” page, as it’s virtually the same as the 1.5lb (680g) of the original iPad of 2010, even though that had a smaller screen. Still, it’s less than the 2.4lb (1.08kg) of a new 12in Macbook, though adding the keyboard/case might make it a close-run thing. The screen size difference does not leap out at you when you see it in the flesh; it looks more like a very lovely screen somehow detached from a notebook. Add the keyboard and it looks very much like a Surface, though the 4:3 screen ratio means it works better in both portrait and landscape than the latest Surface’s 3:2 ratio (which becomes too narrow in portrait mode). Rather than a kickstand, the Pro’s case folds underneath it to hold the device. Apple is not making a PC-alike, though. 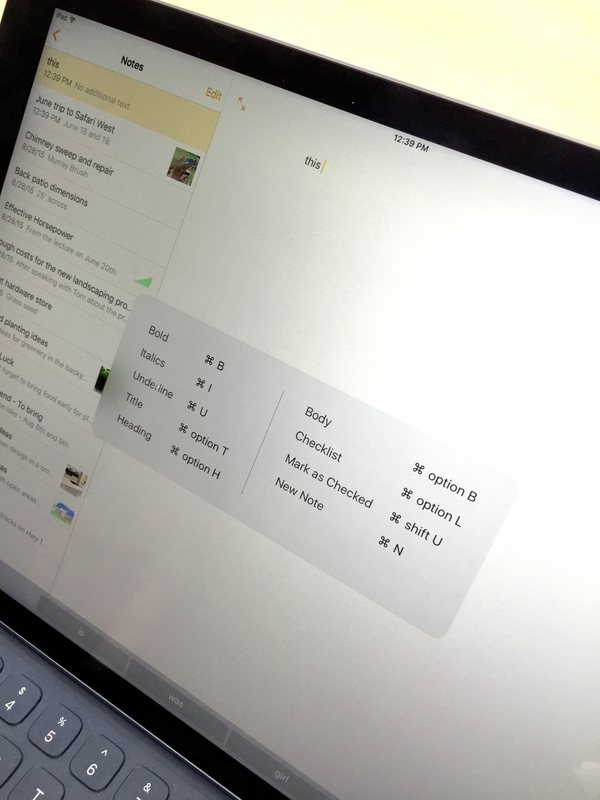 The Pro is still an iPad – all the same apps, the same interface –though iOS 9 brings the ability (as on the Surface) to run two apps side-by-side on a split screen. The two products still start from philosophically different places: the Surface is a PC made more mobile, while the iPad Pro is a tablet given more desktop-like capability. The keyboard is comfortable; it is very like the new MacBook, which has very short travel on the keys. I could type very accurately at once but others might find it uncomfortable compared to the keys of a normal notebook. The Apple Pencil is a stylus – which, while Steve Jobs might have dismissed them for a 3.5in screen back in 2007, becomes useful on a 12.9in one. You can rest your palm on the screen and draw, and the stylus is receptive to motion; it can detect both pressure and motion (though the iPad Pro does not have the new iPhone’s 3D Touch, and thus nor do its apps). There’s even a virtual ruler but unlike a real one, you cannot press against it to draw a straight line, which turns out to be surprisingly difficult. Illustrators are most likely to find the Pencil useful, though the keynote also included a demonstration by a doctor of a 3D body imaging system. In general, it is a niche, though you can also imagine business uses requiring signatures and marks where a stylus would be useful. However, the iPad Pro is not a cheap option (prices start at $799 (£520) in the US and we are still waiting for UK news), especially allied to those accessories. It does have a wonderful screen and iOS 9’s split screen capability – which it has in common only with the iPad Air 2 and the new iPad mini 4 – is very useful; on such a big screen, it is almost essential. 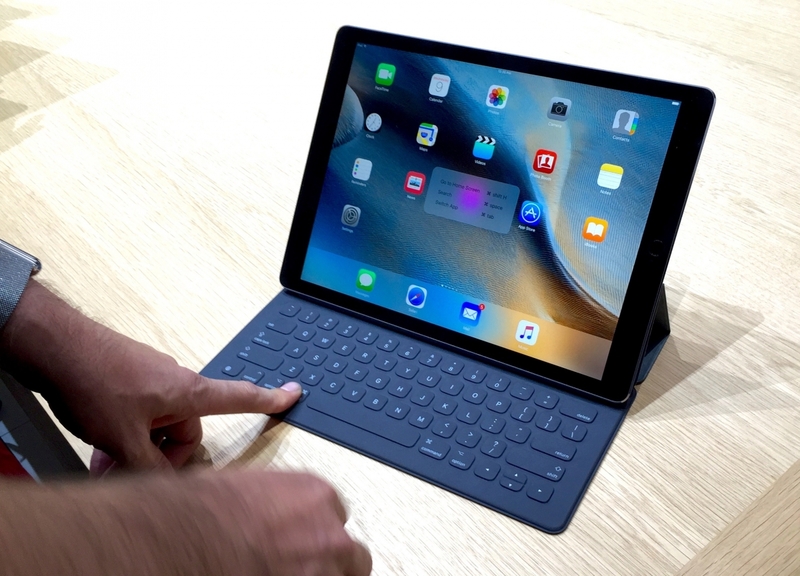 In the end, the iPad Pro is unlikely to drive an abrupt resurgence in tablet sales, which are wilting because the devices just do not wear out, and do not need replacement. The Pro could well fill some niches and attract some large business users who need touch-sensitive apps. 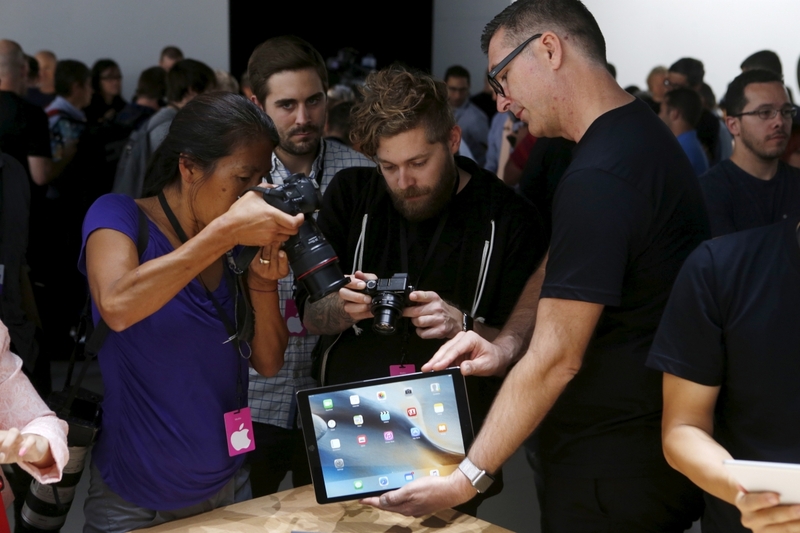 But most consumers will find the smaller iPads fit the bill just fine.